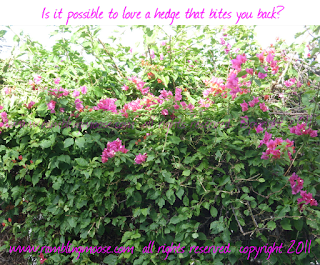 Rambling Moose: Is it possible to love a hedge that bites you back? 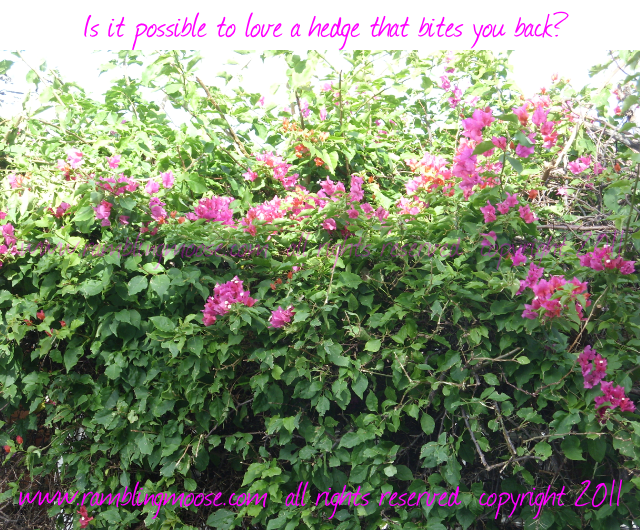 Is it possible to love a hedge that bites you back? This plant probably sold the house. When I first came here, I looked through the front window, through the house, to the back of this hedge. It is currently a 15 foot tall Bougainvillea that is on a frame behind the Florida Room and this is the day AFTER all of the trimming. Beautiful plant really, but the problem is you have to care for them. There's also another wrinkle. A Tropical Storm that May Or May Not come in for a visit. Sorry if this turns into a bit of a rant, but there you are sitting listening to me... so pull up a chair and have a "cuppa" and enjoy. I'm going to serve some cheese later with this wine. So it's time to get out the hedge clippers. Rather, it WAS time. You see, after a solid week of rain, and a week of growing, the four bougainvilleas in the yard needed attention. The one that is bound up to the fence had grown so tall that it was forming a wind break and leaned against the fence with each gust of wind that came in off the ocean. Each lean meant that the whole affair creaked menacingly. If a wind storm hits, we all the sudden have the neighbor's dogs visiting the pool for a midnight dip. The one on the fence had grown so tall that it was another 10 feet above the power lines in the yard. It clearly had run amok. Over the week I went out and got the weed eater and hacked away at its outside thinking I could do it easily as I walked by. No way pal! It was fighting me back. After getting pinched by the thorns on the plant on Monday, I pulled out the big guns. The Jeans and Long Shirt and Garden Gloves. Tuesday that nasty plant was going to meet it's match. Climbing on a ladder, all 6' 4" of me was another 5 feet above the ground. I got to the top of the hedge and lopped its head off. Each time you chop a limb off this plant, it has a nasty habit of falling right on top of you. The plant may only have limbs as thick as your finger for the most part, but the thorns are twice as long as it is thick. With each fall down the pole saw of a limb, it was another scrape down your arm and leg. Pulling the plant out of your clothing meant you ended up with quite a few scrapes. Trust me if the storm does hit here and kills the plant, beautiful though it is, I wouldn't mind. After 3 hours of hacking, I have 40 scrapes that drew blood on my two arms. I counted. There were another 20 on my legs. All of this happened through the jeans and shirt I had on. After finishing on that one plant there were three others. So much was cut down from the first plant near the power wires that I used the electric hedge clippers on the pile as I climbed down to create a place to step. Coming down another branch went up the pant leg leaving a nice long scratch on the left calf muscle. The last straw of it was when I cut one limb high off of the last plant near the bedroom window. It got stuck in the cable pulled "cutter" of the pole saw and had to come down. One tug and I heard the whole thing go CRACK! You guessed it, I nearly fell in the pool as I ran from 15 feet worth of Bougainvillea that was careening down almost on top of my head, thorns and all. One third of the plant was now on the ground complete with a Grown-Man's-Arm thick trunk. Time to quit. Leave the nasty plant to it's own devices. Next year we get a little man in to trim that monster.